Platinum Girl Scout Cookies from Green Bodhi. John Bayes says he’s not like many other growers. He didn’t show up on the scene a few years ago to capitalize on this new age of cannabis legalization. 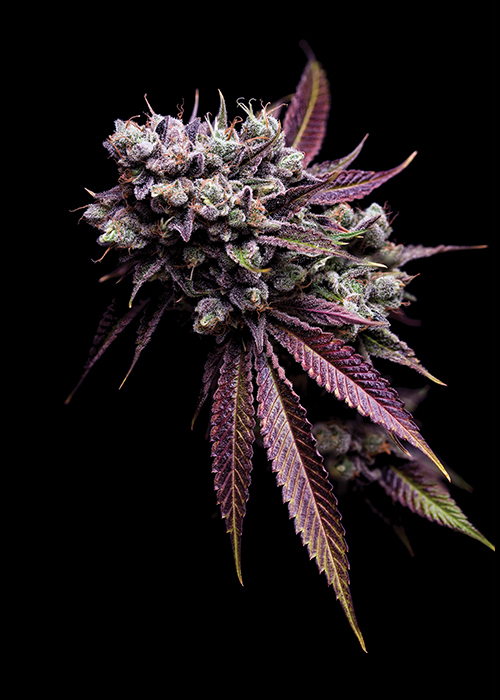 He, and the rest of his team of cultivators at Green Bodhi, have been producing some of the best flowers in Oregon for over a decade and they’re not going anywhere. Of course, there are many OGs who have been growing cannabis as long as Bayes has, but most of them have a similar origin story: They grew up with hippie parents on a multi-generational family farm, or they left their hedge fund job for something more fulfilling. But Bayes took a uniquely winding path to becoming a top-shelf cannabis farmer, and he says that has made all the difference. Bayes begins his story, as one does, with his childhood, when he first started laying down his roots in Eugene, Oregon. Today, he’s 44 and he’s completely settled in that picturesque city, where he’s raising his young child and where Green Bodhi is grounded. “I’d been going to Eugene since I was a kid,” Bayes says. This was the ’70s and the ’80s — when the foundations of cannabis etiquette were being laid in Eugene. The glass scene was filled with legends, the hippie trail was weaving its way north from San Francisco and the city had established itself as the sort of nature-surrounded, cheap-rent-filled city that could be friendly to counterculture artists as they settled down. The first time Bayes smoked pot was as a teen in Eugene, when he was fishing on the bike trail down by the Willamette River and an older teenager handed him some hash. Bayes also remembered snagging buds from his buddy’s dad as an adolescent, and knowing so little about cannabis that he took the buds from the field and not the drying shed next door. Green Bodhi’s signature strain is this Tenzin Kush #4. Completely shaken, Bayes ditched his dream of joining the military — and moved back home to start over. Upon returning to Eugene, Bayes didn’t completely devote himself to cannabis. In the early 2000s, he dedicated himself to searching for ayahuasca, thinking he wanted to be some kind of “urban shaman,” he says. He attempted to discover the fastest path he could to achieve that end goal, which included attending the first International Amazonian Shamanism Conference in Peru. After the conference, Bayes quickly gave up on that goal, but he maintains the experience of switching life paths can be really valuable. It’s at this point — this moment of deep introspection — that Bayes got a tip from a friend that cannabis would be legal soon. Bayes says he thought his friend was being unrealistic, but he got the ball rolling anyways. An intuitive nature has always been a part of Bayes’ life, and this approach fit his cultivation style. To this day, Bayes says that he’s not claiming to be any scientist or botanist, but growing based upon his intuition. For example, a friend gave Bayes his first soil recipe, which he modified by tossing in some soil from an organic orchard. With a few further tweaks, the soil was supporting thriving plants. After picking up more tricks of the trade to add to his own green thumb, Bayes received his first medical marijuana card from the state of Oregon in 2004. From there, he started consulting in California, as he began to maneuver towards the legal market he saw in the future. All along, he kept his focus on building his spread of genetics. Having the pick of the litter much of the time on the plants coming through Eugene didn’t hurt. Bayes says back in the day there were only a few circles in town that held all of the genetics. He was in two of those circles. Bayes laughed about how big some folks were growing back in the day. He remembers admiring their guts, but he was glad he didn’t have anything to do with it. However, there were plenty of good genes going around. Strains like Dogwalker OG and Golden Pineapple got into his hands. Cuts like the Sour Best Sh*t Ever and Fire OG were other strains held in high regard that he was able to add to his genetic library. Besides developing new relationships and growing good genetics, Bayes had plenty left to do to prepare for the legal market. He developed cannabis trainings and took them up and down the coast, while making more and more connections with other people preparing for the legal market. As Bayes developed the techniques and connections behind Green Bodhi, he started to see tangible effects in the quality of the cannabis he was cultivating. A few years ago, Bayes sent some of his strains to get tested at the Steep Hill laboratory in Berkeley, California. He says his results broke records. But Bayes doesn’t claim elite testing scores distinguishes him from the crowd. He says he’d rather be educating others on Buddhism and how mindful farming practices can protect the environment. As a Korean-American and a devout Buddhist, Bayes believes the positive energy and connections in his life in cannabis and the wider world are truly karmic. The name of his cultivation company, Green Bodhi, is in fact a reference to his growing philosophy: trusting the plant’s natural intuition and using regenerative methods that support the earth. In simple terms, this means that Bayes removes any artificial enhancements from his growing strategies. In fact, he was the first grower to adopt Clean Green Certified standards in Oregon, according to Willamette Week. Bayes says that cultivating for Green Bodhi is like building his own private collection. In fact, he only smokes his own cannabis. His signature strain is his Tenzin Kush, which he says the No. 2 phenotype is “the most homogeneous plant” that the people at Phylos Bioscience had ever tested to add to their galaxy of strain genetics. This homogeneity means that there would be an extreme lack of biodiversity in the seed stock of Tenzin Kush if it was self-pollinated. Besides the Tenzin Kush, Bayes says that his Hazy Kush, Best Sh*t Ever and Dogwalker OG are finding their way into the most crosses at the moment. TELL US, what do you think is the secret to growing exceptional cannabis?